Would you like to enjoy the internet and also surf the web online or plan hiking routes, then just get a sim card from Hofer for € 9 and you can surf with your cell phone or your laptop! We only want nice things around us: you will be pampered with farm service from the Gmundner ceramics factory from Gmunden am Attersee. The green service, which fits so perfectly into the mountain world. On the tables you will find real hand-stitched tablecloths, which the lady of the house always tries to find. Maybe you want to get a Schilcher or Morillon from the south Steiermark even by the Tauplitzer wine dealer, maybe even from the top wineries Tement, Polz or Gross. Or just take a place by the dining table in your homey eat-in kitchen and enjoy local bread. And you can even watch the news in the flat screen TV from the dining table. When may we arrange you unforgettable holidays ? Being at home like 'DAHOAM' is our phrase ! Would you like to be near the village and the skiing slope and still live in tranquility ? You have a home on the edge of the centre of Tauplitz, on a small side street from Tauplitz in a 30 km/h zone and you are totally close to the lift: only about 150 m from the main lift into the Tauplitzalm ski region. Do you love the lodge feeling in the summer as well? What about the Steirerhitt'n with farm food, fresh from the smoked oven, in the winter even with a large lodge fire, of course Tuesdays with the Holatrio (here even Jürgen plays along, one of the well-known Seerband! or the Knödlalm in Knoppen - of course on Thursday because of the Holatrio! ), dumplings sweet and salty as you would like and the Biomost or the homemade schnapps! Or the Kraglhitt'n with homemade meals! LODGE FUN + JOYFUL HIKING: Or the Mosthitt'n or the Eselsalm. You have to go to the alps on Sunday by Kurt in the Lenzbauern lodge for a Sunday meal. Or the alpine lodge on the Steirersee. Or do you prefer Michelin stars, then the Grimmingwurzn in Bad Mitterndorf, the Post or the Max in Grundllake, the Duke Johann in Bad Aussee would be ideal. Whether hiking for fun or long distance hiking to stunning summits. Do enjoy the summer holidays and just as the Emperor Franz in emperor's times , who enjoyed his summer holidays in this region with his court every year . Even today, the Habsburgers ( = the late emperor's family) still have their summer residences in this historical region, which they also inhabit, like on Grundllake, on the Atterlake, in Altaussee. The Ausseerland has and always has had a special attraction for artists. Thus, the Via Artis in Grundlsee or Altaussee would be a must! Simply enjoy the homemade Filztascherl from the Tauplitzer Walkerei. DAFFODIL FESTIVAL + THERMAL POOL: The daffodil festival in the Ausseerland is unique in Europe: wild daffodils change the mountain landscape into an aromatic, white sea of blooming flowers. Or is it the secretive Toplitzsee in which one assumes Hitler's gold treasure , which attracts curiosity. Here you should take the Friday evening in order to be able to enjoy an open air concert in the Fischerhütt'n. Or what about thermal water, the thermal springs in Bad Mitterndorf, integrated in the newly built Aldiana Club makes it possible. Here you can go swimming both in the summer and winter in warm thermal water even by the open air! This is where Petri Jünger could learn fly fishing! Or just plan to see the Saiblings festival in July or the musical hike with a fairytale teller on the Altausseersee with the scenery of the Dachstein and the Loser. Unwind! : For the annual festival 'Mountain in flames', when Bengal fire is lit around the Altaussersee, you should be there! Does holiday mean for you to unwind, then hiking over the 6 picturesque mountain lakes on the Tauplitzalm would be good! The 4-person chair lift brings you from Tauplitz directly to the Tauplitzalm with the family (this means with a stroller, dog + bike!)! Pass the simplest lodges, which are only managed in the summer and often cannot offer you more than spring water and freshly baked bread. You will not believe it, the largest part of the 7 hour hike from the mountain lift station of Tauplitzalm by the lakes down to the Gnanitztal, it is still like being 'back in time': not a lot of groups of tourists hiking! The highlight is the Gnanitztal, where Heidi could live with the Almöhi - here wild west romantic films could be filmed! This is a real paradise! Mountain air + unwind + valleys like 'back in time' + with the whole family! Does holiday mean unwinding for you, then the far hike over the 6 picturesque mountain lakes on the Tauplitzalm would be great! The 4-person chair lift brings you from Tauplitz directly to the Tauplitzalm with your family (this means with a stroller, dog + bike!)! Past the simplest lodges, which are only managed during the summer and often cannot offer you more than spring water and freshly baked bread. You will not believe the largest part of the 7 hour hike from the mountain lift station Tauplitzalm through the lakes down to the Gnanitztal is still like being 'back in time': no large crowds of tourists hiking around! The highlight is the Gnanitztal, where Heidi could live with the Almöhi - here romantic wild west films could be filmed! It could not be more like paradise! Top kitchen + larch floors + painted farmer chests + farmer corner bench + farmer table After an adventurous day, for example, by the Saibling festival in July or after a musical hike with the fairytale speaker by the Altausseersee with the scenery of the Dachstein and the Loser or also after a visit to the annual festival 'Mountains in Flames', when the Bengal fire is lit around the Altaussersee, just enjoy your comfort apartment with a top kitchen (oven + fridge are not on the floor!) with the homey larch floors, the painted farmer chests, the cosy farmer corner bench and your balcony with a stunning view of the Ennstal up to the Riesneralm and the Planneralm! 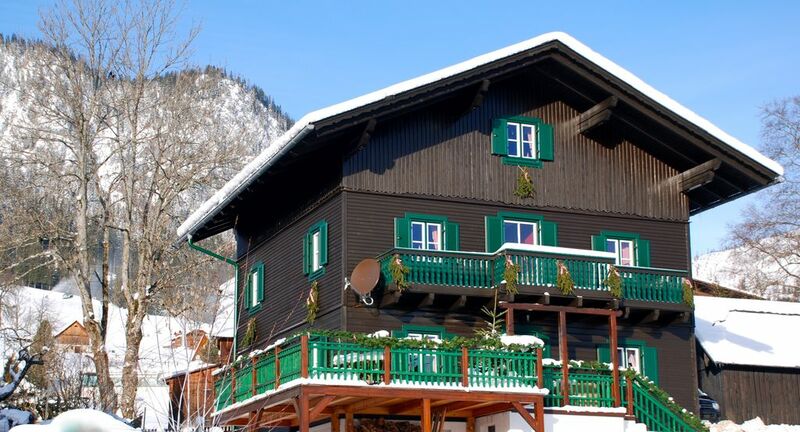 Winter sports for the family + traditional lodges + Mein Dahoam' lift nearby + peaceful + stunning view! Are you looking for an idyllic city at 1000 m above sea level, with soft tourism without high rises? Where there are farmer's markets, flea markets, milk and cheese directly from the farmers? Do you prefer a winter sport city for the family with snow covered streets in the winter? Then Tauplitz is the right place for you. And snow is guaranteed up on the Tauplitzalm until the end of April! the slopes nearby. You can also manage the slopes and then go back with the train to 600m above sea level. Or how about going upon on the Tauplitzalm with cross country skiing in untouched nature? Go golfing on the golf course from Bad Aussee and enjoy the stunning scenery and the mountain panorama of Dachstein and Loser. How about relaxing with swimming in a summer mountain lake or in the Grundlsee or in the Altausseersee! which you can have made with hand-pressed spun silk from the hand printer Sekyra. Or how about hand-made Krachledernen Lederhose or the leather boots - really hand made. Or the golf course in Idning is stunning (about 6 km away) and then enjoying a drink in the golf hotel Hotel Schloss Pichlarn. Lush green on soft hills invites you to golf in breathtaking nature. Ski: Are you looking for tranquillity day and night, would you still like to be near the lift (only 150 m to the main lift on the Tauplitzalm with 42 km slopes + 17 lifts). Are you a sport or nature lover, then you will love your time here in the middle of a unique mountain panorama. Whether alpine skiing or cross country skiing or with snow shoes, you can always go into a stunning mountain landscape. 15 paths / 100 km cross country directly past a variety of lodges or the participation on the Steiralauf in Bad Mitterndorf or the annual ski jump world championship in Tauplitz! And how about romantic winter fun with cosy carriage rides, of course with a snack in one of the many alpine lodges. During the evening, you can go for a night ski on the Tauplitzalm down with the ski teacher Peter Vasold, of course with torches and snacks on the Tauplitzalm or night sledding in Tauplitz to role back to the lodge. Die Betten sind bezogen bei Ankunft. Mitzubringen sind die Handtücher für Bad und Küche . Die Kosten für Strom werden am Abreisetag abgerechnet .